When the fascist dictators in Europe who had made concordats were replaced by democratic governments Vatican diplomacy became more flexible. It was no longer a matter of a pact with a stongman, but rather of supporting whichever politician or political party best furthers the interests of the Church — and sometimes of trying to undermine those that don't. (See Catholic Church steps up campaign to oust Spanish government, 2005-09-19.) However, the basic framework and aims of Vatican diplomacy, as set forth in Manhattan's excerpt, remain relevant today. (a) To cultivate good relations between the Apostolic See and the Government to which they are accredited. (b) To watch over the interests of the Church in the territories assigned to them and to give the Roman Pontiff information concerning conditions in these areas. (c) In addition to these ordinary powers, to exercise such extraordinary ones as may be delegated to them. When it is not possible to conclude a Concordat, then the nuncio should strive to reach a compromise which, instead of a formal treaty, becomes a modus vivendi. If that, too, is impossible, then the Vatican can occasionally send to a given Government special Papal representatives on particular occasions. Usually the Vatican charges a local primate with the care of the Church's interests. Although the outward machinery of Vatican diplomacy does not differ very much from that of any secular Power, fundamentally obey differ because of two main characteristics — namely, the aims and the means at the disposal of Papal representatives. The Papal representative must strive to further not only the diplomatic and political interests of the Vatican, but, above all, the spiritual interests of the Catholic Church as a religious institution, and his mission therefore assumes a dual character. Owing to this, the Papal representative has at his disposal, not only the diplomatic machinery that any ordinary diplomatic representative of a lay State would have, but also the vast religious machinery of the Catholic Church inside the country to which he is accredited, as well as outside it. In other words, the Papal diplomatic representative will have at his disposal the entire hierarchy of a given country — from cardinals, archbishops, and bishops down to the most humble village priest. Moreover, the Catholic organizations of a social, cultural, or political character, headed by the Catholic parties, would obey his instructions. The result is that a nuncio can exercise formidable pressure upon a Government — pressure of a religious-political nature that is denied to any lay diplomat. Because every priest is de facto an agent of the Vatican and can collect reliable information about the local conditions of his parish — or, if he is a bishop, of his diocese — or, if he is a primate, of his nation — the Vatican, to which all these data are sent, is one of the best centres of information of an economic, social, and political character in the world. When to this is added the influence that the Vatican can exercise on the various Catholic parties and Catholic Governments, and on national and international assemblies, it becomes evident that the power of this great diplomatic-political centre is felt throughout the world. This is recognized by most nations, including non-Catholic countries, such as Protestant United States of America and Great Britain, and non-Christian countries like Japan. 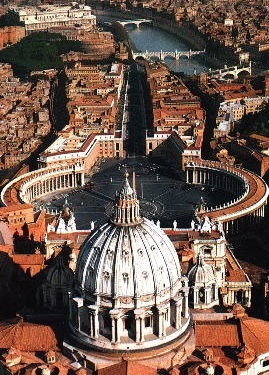 The importance of the Vatican as a diplomatic centre is enhanced in war-time. For during hostilities, when diplomatic contact between belligerent countries is cut off, the warring nations can get in touch with each other through the Vatican. The services rendered and the knowledge thus gathered from both sides give the Vatican enormous prestige in the eyes of lay Powers. For these and other reasons, during the First World War countries hastened to send their representatives to the Vatican: Germany, Switzerland, Greece, Protestant Great Britain, France, and even Russia. By the end of the war thirty-four nations had permanent diplomatic representatives accredited to the Pope. During the Second World War that figure was almost doubled, and great countries such as non-Christian Japan and Protestant United States of America sought means by which they could be represented at the Vatican — the United States of America by resorting to the diplomatic device of sending a “personal Ambassador of the President”; the Japanese Empire by accrediting an envoy with the full rank of Ambassador to the Holy See. From the very beginning of the Second World War until its end, in 1945, the Vatican, with fifty-two ambassadors, ministers, and personal envoys sent to it by almost all the nations of the world, was a diplomatic-political centre equal in importance to the great capitals where the destinies of war and peace were conceived and discussed: Washington, Moscow, Berlin, London, Tokyo. We shall see later why the Vatican, although it owned not a single war aeroplane, tank, or warship, was in a position to deal as an equal with the greatest military Powers on earth before, but above all throughout, the Second World War. * This quote will be from the 1917 Code, not the present 1983 revision. It appears to correspond to parts of the section on pontifical legates, Can. 364.7-8 and Can. 365 §1.1.